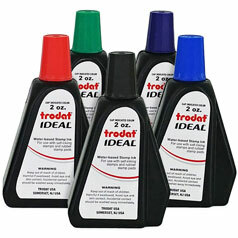 Replacement water-based ink for Ideal self-inking stamps and industrial-sized 6x8" stamp pads. Available in black, blue, red, green and violet. Rated 5 out of 5 by DelA16 from Good Value Needed green water-based ink refill for our stamp pads. The value for 2 ounces at $8 is wonderful. Usually you can only purchase 1/2 an ounce for $4 to $6. It was also very easy to order and have sent to our store. Thank you! Rated 5 out of 5 by Tsledz from Exactly what we were looking for. Our date stampers life ended and we needed to order new custom stamps for the Accounts Payable department. The size is great and we have enough room to actually see the information we specify. Thanks! Rated 5 out of 5 by Pleco from Great Ink Refills my 4x6 pad giving it new life. A good item. Rated 5 out of 5 by Cutie from Great Inventory! I looked everywhere to get a refill bottle of purple water-based ink to refill my ink stamp. Nobody had it except RubberStamps. Thank you for carrying it! Rated 5 out of 5 by Erin Megan from Works Great! Easy to use, bright color, not sticky dries fast once applied but stays damp in the stamp pad for months. Rated 5 out of 5 by a fan from Love the ornate initials! Thanks, we love ours ordered 3 yrs ago, & going strong. I'm ordering it for some family Christmas presents :~) Great product! Rated 1 out of 5 by steelcitysalt from Not enough ink for 6x8 pads I purchased a custom made rubber stamp 6" along with a 6x8 stamp pad and a 2oz bottle of black ink came with it. The 2oz bottle was not nearly enough to even fill the stamp pad with ink let alone make one stamp! I'm online now trying to find refill ink and this one is $8 for only 2oz of ink, I'll have to buy 5 just to stamp my products! Disappointed. Trodat and Ideal Replacement Ink Vial (2 oz) is rated 4.7 out of 5 by 14.